Eight soldiers were reportedly killed in clashes with PKK terrorists on Friday in southeastern Hakkari province. According to a statement released by the General Staff, six soldiers were killed and eight others were injured in clashes with PKK terrorists in the Çığlı military zone in the Çukurca district of Hakkari province. 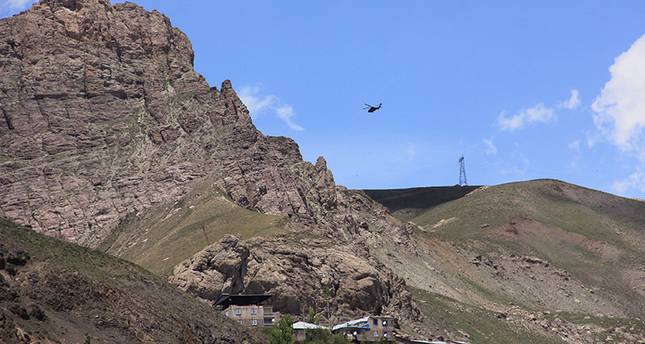 Less than an hour later, a helicopter gunship was sent to the region in response to the clash, but it crashed due to a technical fault, killing two pilots, the statement added. Fifteen PKK terrorists were reportedly killed in southeastern Şırnak province in earlier clashes that resulted in the loss of eight other soldiers, the military said. Four PKK terrorists were killed on Thursday while loading explosives onto a truck in southeastern Diyarbakır province hours after a separate blast targeting a military barracks in Istanbul wounded eight people. Operations in the region are ongoing, the General Staff said. The military said that 140 PKK terrorists were killed and 73 injured in anti-terror operations in the past two weeks. Two PKK terrorists were also killed in a clash in southeastern Siirt province. Eleven PKK terrorists were killed in two separate operations in the southeast on Wednesday, the military said Thursday. According to the General Staff's statement on its website, six terrorists were killed in an operation in the Nusaybin district of Mardin province, putting the death toll in Mardin at 366 since operations began. Security forces also destroyed 17 improvised explosive devices in the operation. Five additional PKK terrorists were killed in Şırnak, increasing the number of terrorists killed there to 340. The military also said that five explosives were defused in the province. The government has intensified counterterrorism operations following recent attacks carried out by the PKK, which is recognized as a terrorist organization by the U.S., EU and Turkey. Military sources said on Wednesday that security officers have killed 4,571 PKK terrorists since the launch of anti-terrorism operations on July 22, 2015. The number of terrorists killed includes those killed in Turkey and in operations launched against the group in its camps in Northern Iraq. Meanwhile, sources said that 695people were captured wounded, in addition to 716 others captured and 641 who surrendered to security forces. Formed in 1978, the PKK has been fighting the Turkish state for an independent Kurdistan since the 1980s. The group then shifted its goal to autonomy in the predominately Kurdish regions of Turkey.